ePublishing Knowledge BaseePublishing Knowledge BaseePublishing Knowledge Base RSS FeedsHow do I create an RSS feed with full bodies for the articles included? There are several reasons you may need an RSS Feed that shows the reader more than just a list of article headlines, teasers, and images. The most common reason is an app in which you want the full body of articles to show. Learn more about creating RSS Feeds with multiple associated taxonomies. 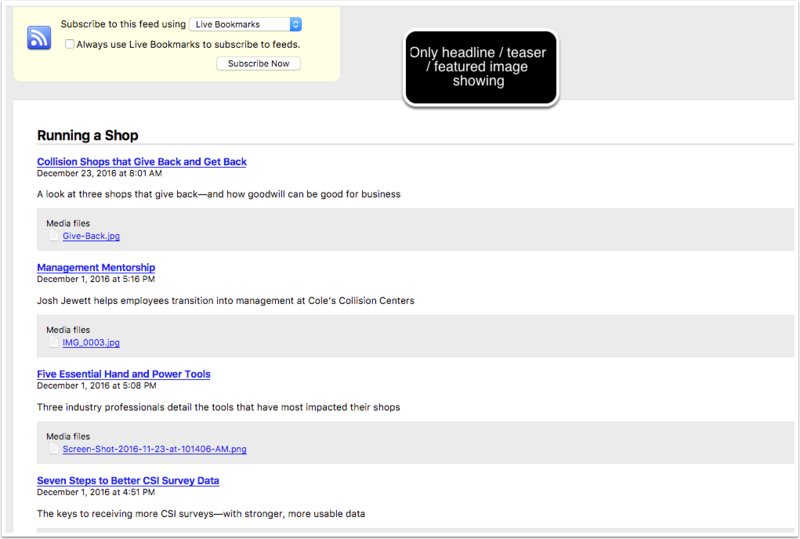 2. ePublishing creates RSS feeds automatically for all taxonomies in your system. Learn how to add taxonomies here. The Subscribe button with the RSS Feed icon allows a website visitor to open the RSS Feed and copy the URL to their preferred RSS readers. 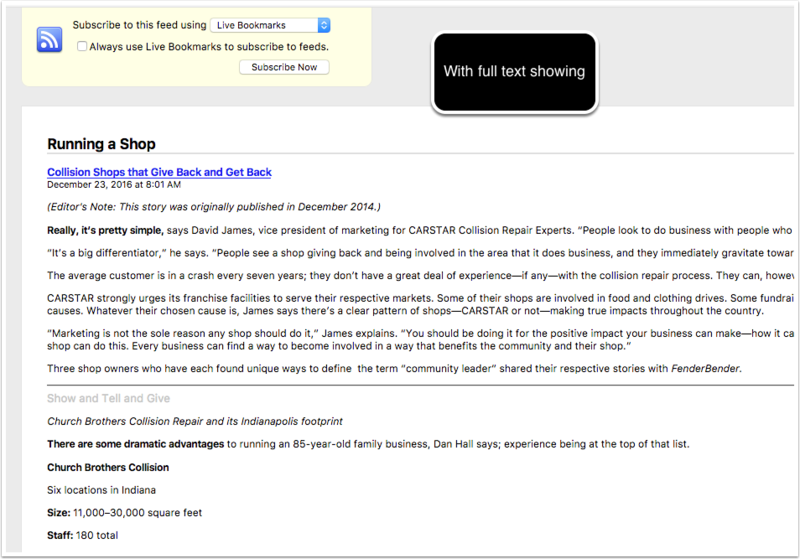 Any ePublishing RSS Feed can be updated to allow it to show the body of the articles included in the feed. Appending ?full_text=1&api_key=[API Key] to the end of any RSS feed will result in the body of the article being returned. 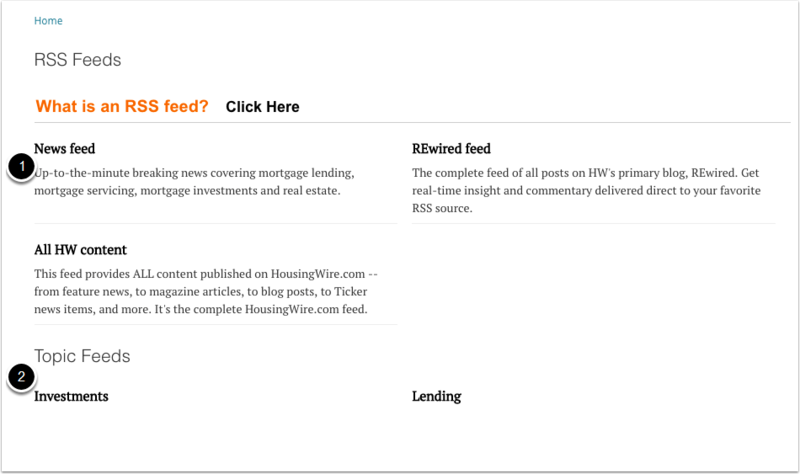 First, create or update your website's RSS Feed API Key. The body holds all API keys for RSS feeds. You can have multiple RSS API keys, one for each app vendor or specific use. The API key string must be at least 16 characters long. Only use letters and numbers. Letters should be a mix of upper and lower case. If you have more than 1 RSS Feed api key, separate the keys via a comma (,). See below. Prev: How do I create an RSS feed for a single topic? Next: How do I create a new directory listing?